The Rogue Folk Club presents RogueFEST! Upstairs Cabaret, 15 Bastion Square, Victoria BC. TZIGANE, the Art of Time Ensembles first production of the season! The influence of the Roma from Ravel to Flamenco to Django. 17th Annual Fraser Valley Acoustic Guitar Festival "From the Gut 2014"
The Grand Finale Concert features FOUR great bands this year - including Van Django! 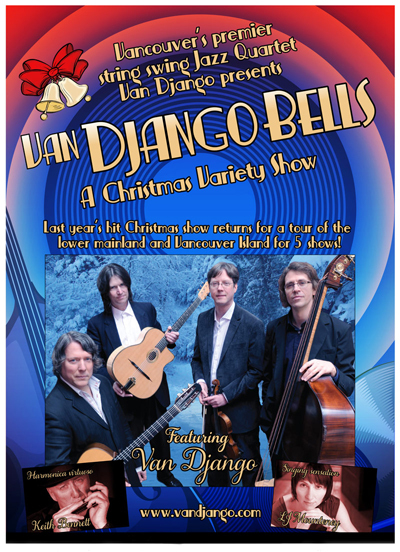 Van Django performs in Tofino as part of the West Coast Winter Music Series! 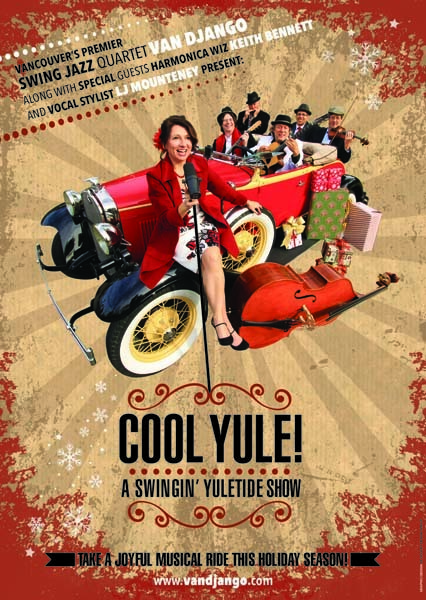 Based on the success of our previous gigs, the Rogue Folk Club has decided to host yet another Swing Dance featuring VAN DJANGO DANCE COMBO! The dance will be held at the St James Hall, an old converted church with wonderful acoustics and a great dance floor. Tickets are $12 or free with an evening ticket (available at the door). 950 41st Avenue West, Vancouver. B.C. A Tribute to Django Reinhardt: Musicfest Vancouver presents Van Django in concert with special guests Bria Skonburg, vocals/trumpet, Evan Arntzen, vocals/ clarinet and Craig Scott, percussion/vibraphone. Delight in the sounds of world music performed in an exquisite garden. Each week, a different band, a different sound. This week is: Van Django: An acoustic string ensemble that raises the roof with punchy, driving music, this foursome fills the action-packed genre of "hot jazz". Tickets available at the box office 604-270-1812.